Summer Two-Year-Old Hereford Bulls - Registered Purebreds Some of our best Herefords. We moved the Herefords all to May-June to produce these “Summer Twos.” They are thick, low set bulls. These bulls are fleshy, quick gainers, they’re low set like all Herefords should be. These will really work in your crossing or straight bred programs and as a PLUS will be full two year olds going to your cows next summer. They will impress everyone, whatever breed you run. 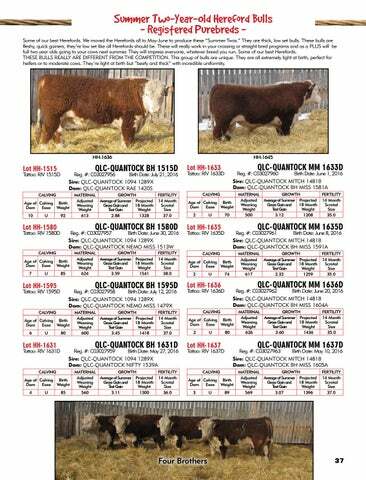 Some of our best Herefords. THESE BULLS REALLY ARE DIFFERENT FROM THE COMPETITION. This group of bulls are unique. They are all extremely light at birth, perfect for heifers or to moderate cows. They’re light at birth but “beefy and thick” with incredible uniformity.